Day 2 of this year's Sierra Challenge was one of the easiest ever. San Joaquin Mtn lies atop the Sierra Crest between Minaret Vista near Mammoth Mtn and June Lake, about 10mi to the north. The hike would barely make 3,000ft of elevation gain with less than six miles each way. As an SPS peak, it had been selected by Michael Graupe for his list finish as he becomes only the 4th or 5th non-member of the Sierra Club to complete the SPS list. The weather was our biggest concern today, more specifically the smoke that was forecasted to fill the air, blowing in from the west where several fires were burning in Yosemite. The turnout today totaled two dozen folks, either eager to celebrate with Michael or eager to join on an easy day, or both. It was indeed quite smokey when I left the motel in Mammoth Lakes, though not so bad by the time I had driven up to Minaret Vista. Seems the smoke had settled some into the valleys overnight and was not as bad at the higher elevations. It was good to get a 6a start because the smoke would return in the afternoon, much as it had in the previous few days. Not everyone made it for the starting photograph, but our full contingent would make it to San Joaquin's summit in time for the party. Our route went over one bonus peak ( Peak 10,242ft) enroute and almost over another ( Two Teats) as we made our way along first the 4WD road and then the use trail that follows the crest to San Joaquin. At the top of Peak 10,242ft it became clear that we'd be able to hike above the smoke today, and our views to the Ritter Range that had been hazy to start were suddenly much clearer when above 10,000ft. I visited the lower, class 3 west summit of Two Teats with a few others before following that up with the easier east summit. 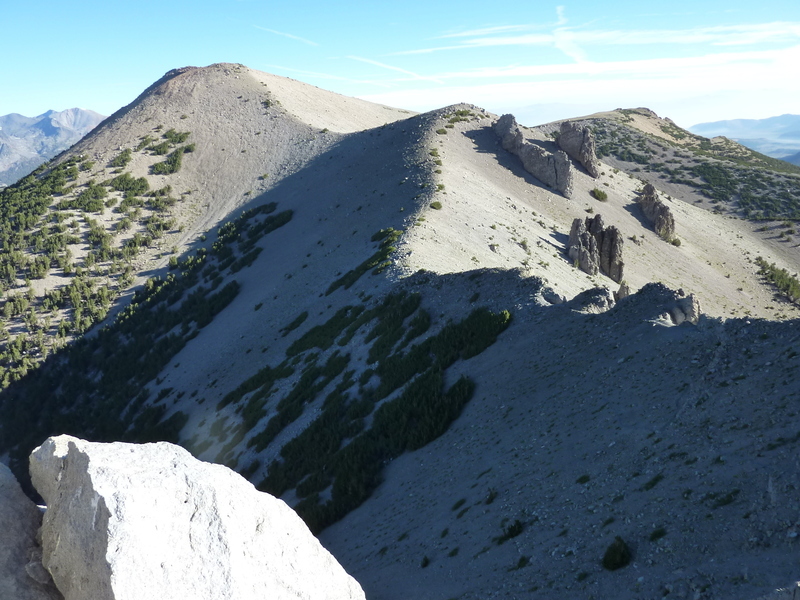 It took about 2hr20min to make my way to the summit of San Joaquin, though Zach had reached it much earlier and was already on his way back when I left Two Teats. "Aren't you going to stay for the celebration?" I asked, but Zach had another engagement to meet up with a friend for some rock climbing. I decided to give everyone the same finish time today so as not to have Zach's touch-n-go skew the results - I didn't want anyone to feel they had to leave early to keep from losing time. By 8:45a we had a large enough quorum to allow the festivities to begin. The register entry for our group took nearly an entire page of the large-format book. I had told everyone (excepting Michael) via email that it was customary to bring libations or food to the summit for the celebration. There were only a few food items that came out of the various daypacks but there seemed to be no shortage of alcoholic choices. It was the most I'd ever consumed on a summit, about an hour all told. We sat around telling stories, sharing beverages and getting tipsy at 11,600ft. I counted some seven different beverage choices that were passed my way, finally topping it off with Bailey's that Iris was dispensing from a Starbucks frappucino bottle - very sly, this one. We eventually gathered everyone around for a summit photo before packing up our stuff and dispersing. I decided to join some of the others for a visit to Carson Peak, about 2.5mi further north along the crest. Tom had left his Jeep at the base of the mountain the evening before to allow a shuttle and it proved popular - seven of us in all for a 5-seat vehicle. The hike between the two is exceedingly easy, all class 1, which we managed in a little over an hour. The buzz had been pretty good descending from San Joaquin, but it had all but dissipated by the time we reached Carson Peak. We found a register there which we signed while taking a break at the summit. Chris made for an eighth to our party but he was heading in another direction afterwards - to White Wing and June Mtn where still others had gone to more directly for bonus peak goodness. Upon leaving Carson's summit, we bade goodbye to Chris as the rest of us made our way down a class 2 cirque southeast of the summit that funneled into some class 3 scrambling and mild bushwhacking lower down before eventually emerging at Fern Lake where we could pick up a trail. We paused at the lake to allow time for a swim. It wasn't so much a swim as a long wade out into the shallow lake followed by a full immersion to qualify for the Aqua Jersey. Such a competitive little group, no? After clothes were restored to their rightful owners, we headed down the trail, about two miles to the base of the mountain and our waiting vehicle. It would take us another hour to return to Minaret Vista where we found a second party in progress. Laura had come up from Bishop with a friend of hers to provide a brunch buffet with, of course, more libations. I kept the latter to a minimum on this round, but the food items I had no hesitations about. The smoke had come back with a vengence this afternoon and we would sit around in the thick haze as it actually got chilly without the full force of the sun bearing down on us. Later we would retreat back down to town where the smoke was no better but we could get a shower and then pizza afterwards for yet another party. Three parties for one list finish - some sort of record perhaps?